"Andrew Volstead: Prohibition’s Public Face", by Rae Katherine Eighmey. In Minneosta History, vol. 63, no. 8 (winter 2013/14). Prohibition in Minnesota, by Margaret Murray. Andrew J. Volstead and Family Papers, 1868-1955. This archival collection (1868-1955) consists largely of political materials of Volstead, a Granite Falls lawyer and Republican congressman (1903-1922). Much of the correspondence is dated 1920 to 1922 and concerns Prohibition, the National Prohibition Act of 1919 (the Volstead Act), and Volstead's 1922 re-election campaign; there are also copies of Volstead's speeches on Prohibition. This archival collection (1876-1919) contains financial reports; minutes and memoranda of meetings and conventions, including Instructions for block captains, information on persons who contributed to the party, and the amounts contributed; letters soliciting support and donations; and other records of the Prohibition Party's administrative organization in Minnesota. 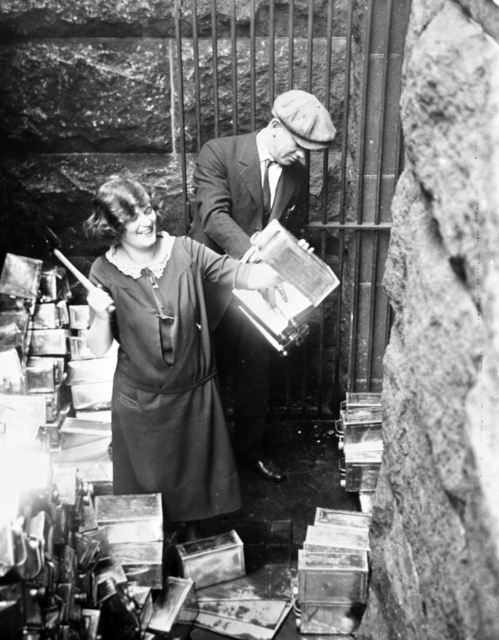 Prohibition is the period in American history from 1920 to 1933, when the 18th Amendment to the United States Constitution prohibited the manufacture, sale, transport, import, or export of alcoholic beverages. Congress voted its approval of the amendment in October 1919, and enacted it into law as the National Prohibition Act of 1920. Anti-Saloon League attorney Wayne Wheeler drafted both the amendment and the bill -- the National Prohibition Act. Andrew J. Volstead, U.S. Representative from Minnesota's 7th Congressional District and chair of the Judiciary Committee, sponsored the bill in Congress and lent his name to the informal "name" of the act: the Volstead Act..
Groups that fought to ban consumption of alcohol included the Women's Christian Temperance Union (WCTU) and the Anti-Saloon League, both of which had Minnesota chapters. Their success and anti-German sentiment after World War I led to the passage of the Volstead Act. It put legal brewers out of business and opened the nation's door to unintended consequences: bootlegging, gambling, prostitution, rackets, gangsters, and organized crime. The 18th Amendment was repealed with the passage of the 21st Amendment to the U.S. Constitution on December 5, 1933.
prohibition- The act of forbidding something, especially by law; a law or regulation that forbids something. Prohibition- The prevention by law of the manufacture and sale of alcohol, especially in the U.S. between 1920 and 1933.
temperance- The abstinence from alcoholic drink. The Temperance Movement- Moderation or self-restraint, especially in drinking or eating.